(Bloomberg) -- A rocket from the Gaza Strip struck a house in central Israel before dawn, forcing Prime Minister Benjamin Netanyahu to cut short a U.S. trip where he had hoped to showcase his diplomatic stature ahead of April 9 elections. The rocket destroyed the house but its residents escaped serious injury after an air-raid siren gave them enough time to flee. The biggest damage on the eve of elections may have been to Netanyahu's reputation as the guardian of Israel's security, as it was the second attack on Israel's heartland from the Palestinian territory in less than two weeks. Netanyahu, who had traveled to Washington to address a powerful pro-Israel lobby, vowed a strong response. Reserves soldiers were called up, and the army declared closed military zones near the Gaza border. "This was a criminal attack on the State of Israel, and we will respond forcefully," the prime minister said in a video provided by his office. He will meet with President Donald Trump on Monday morning, but will leave the U.S. without delivering a speech to the American Israel Public Affairs Committee in person. The attack so close to the election puts Netanyahu in a tight spot. Critics say he has squandered Israel's deterrence by not launching a full-scale war on Hamas-run Gaza despite repeated rocket attacks. At the same time, his electoral prospects could be hurt if he orders a major offensive that results in heavy Israeli casualties. Politicians including Finance Minister Moshe Kahlon say Israel should consider reviving its policy of assassinating leading Gaza militants. "The time has come to change Israel's strategy and extract a high price from Hamas, especially its military wing, even if it means an all-out conflict," said Amos Yadlin, a former military intelligence chief and current executive director of the institute for National Security Studies at Tel Aviv University. "Timing should be carefully planned, taking into consideration intelligence reports, operational factors, weather and even elections. "What is important is to surprise Hamas and strike hard," he said. Avi Dichter, the head of parliament's foreign affairs and defense committee, told Army Radio that Israel's political leaders wouldn't hesitate to launch an offensive against Gaza "even if that means putting off the elections." He wasn't speaking for the government. Postponing a vote would require special legislation backed by 80 of parliament's 120 legislators. It has happened once before, around the 1973 Middle East war. Attacks on Israel have escalated since Hamas recently suppressed rare protests against the dire conditions in the coastal enclave, which is groaning under Israeli and Egyptian blockades, sanctions imposed by the West Bank-based Palestinian Authority, and Hamas taxes. Hamas-backed "nighttime confusion units" have intensified their assaults on Israeli soldiers along the border, and have dispatched incendiary balloons. Three Palestinians were killed in confrontations with Israel last weekend. None of the militant groups in Gaza claimed responsibility for Monday's attack. A member of Hamas claimed the launch had been an accident -- the same explanation given for a March 14 attack on Tel Aviv. 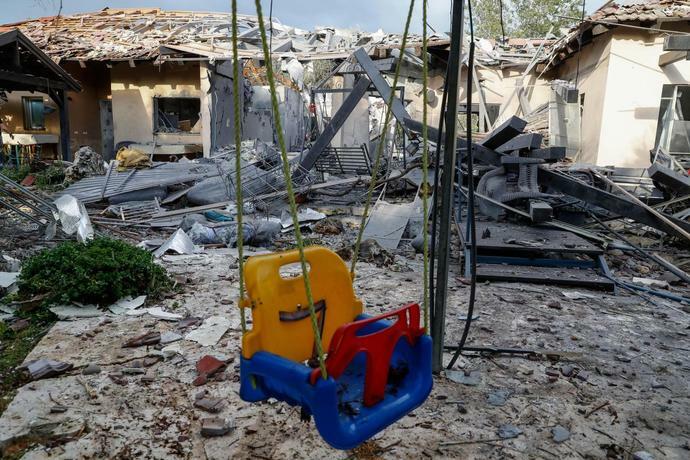 Israeli military spokeswoman Major Mika Lifshitz said Hamas manufactured and fired the rocket, which traveled about 100 kilometers (60 miles) before hitting the house in the village of Mishmeret northeast of Tel Aviv, wounding seven people. The military implied an Iron Dome missile defense system wasn't deployed in the area. The rocket fire interrupted a U.S. trip Netanyahu hoped would restore luster to a campaign tarnished by his recent entanglement in a naval acquisition bribery scandal. The prime minister has not been a suspect in the case, which has ensnared some of his closest associates, but Israeli media say prosecutors are weighing investigating him after learning Netanyahu once held shares in a company that supplied the Germany shipbuilder Thyssenkrupp AG. Netanyahu has said he sold the shares in 2010, years before the submarine deal. A Thyssenkrupp spokesman said Sunday the company Netanyahu invested in had no connection to the marine unit, the Times of Israel reported. Some polls have shown Netanyahu's Likud party slipping since these reports emerged, but his current coalition of right-wing and religious parties still would have an advantage over a center-left bloc led by former military chief Benny Gantz. Netanyahu will use his little remaining time in Washington to highlight his closeness with Trump. The U.S. president has made support for Israel a linchpin of his foreign policy and has embraced Netanyahu, despite corruption allegations against the Israeli leader in several cases. The Trump administration last year abandoned the Iran nuclear deal and moved its embassy to Jerusalem from Tel Aviv, after 20 years of delayed U.S. promises. Last week Trump broke with decades of American policy by saying the U.S. should recognize Israeli sovereignty over the strategic Golan Heights, which Israel captured from Syria during the 1967 Middle East war. --With assistance from Saud Abu Ramadan.